Simple and pure, atamasco lilies were among the first of many beautiful wildflowers to be noticed by the Jamestown colonists as they explored the tidewater region of southeastern Virginia. Atamasco lily is a perennial herb that grows from a subterranean bulb. The bulb is dark, with a short neck and papery tunic formed by remnants of old leaf bases. Leaves are glossy green, linear, flat to somewhat concave, up to one half inch wide, approximately one foot in length and, overall, rather grasslike. When not in flower the plants can be easily overlooked. Flowering stems are leafless scapes that are about as long as the leaves. In crosssection the scapes are hollow. Each scape terminates in a single flower. A few papery bracts subtend the flower stalk where it attaches to the tip of the scape. Flowers are erect to slightly inclined. As in many “lilies,” sepals and petals are only subtly distinguished, so the term tepal is often used to describe perianth elements. Six tepals are fused at their bases forming a gradually flaring funnellike structure that may be up to one inch in length. Above the greenish funnellike portion, the individual tepals separate, flare laterally, and take on a white coloration. Sometimes the perianth lobes are tinged with pink or purple, especially as the flower ages. From base to tip the flowers are approximately three inches long. Overall, flower form is reminiscent of a small trumpet lily. Indeed, an alternative common name is “Easter lily.” Inside the trumpetlike perianth there are six stamens attached to the tepals at about the same level that they diverge from the funnellike base. The stamens are approximately equal in size and about 2 inches long or a little less. Anthers are attached to filaments at their midpoints, and shed bright yellow pollen. The style is somewhat longer than the stamens and terminates in three stigma branches. The ovary is inferior, i.e., located below the perianth tube; it is threelobed. Fruits are thinwalled, dry capsules. Ovules are numerous in each of the three chambers of the ovary. Eventually the ovules mature into flat, Dshaped, shiny, black seeds that are released by splitting of the capsule wall. The genus name Zephyranthes is derived from two Greek words, zephros, meaning west wind and anthos, meaning flower. The species name, atamasca, is attributed to Tapehanek words meaning under grass, in reference to the location of the bulb under grasslike leaves. Linnaeus originally named this plant Amaryllis atamasca in his monumental book, Species Plantarum. However, botanists have since chosen to restrict the genus Amaryllis to a single species from South Africa. During its nomenclatural history some botanists altered the species name to “atamasco,” but “atamasca” is the original spelling for the scientific name. The genus Zephyranthes contains about 50 species found from the southeast United States to Argentina. Sixteen species occur in the US, mostly in Florida, Texas and the intervening Gulf coast region. Of these, the closest relative to the atamasco lily is Zephyranthes treatiae from Florida; it differs in having longer perianth tubes and narrower leaves. Many species of the genus live in seasonally dry regions where they emerge from dormancy and produce flowers in a rapid response to infrequent heavy rainstorms; this physiological characteristic is responsible for common names like “rain lily,” “fairy lily,” and “zephyr lily” that are applied to many species of Zephyranthes. Zephyranthes is classified in the family Amaryllidaceae, or amaryllis family. As such it is related to a host of showy horticultural species and hybrids such as the familiar daffodils (Narcissus), florist’s amaryllis (Hippeastrum), snowdrops (Galanthus) and snowflake (Leucojum), to mention a few. Bulbs and foliage contain several toxic alkaloids. The bulbs are described as extremely bitter, so even accidental ingestion of toxic quantities of the plant rarely happens. Atamasco lily makes a handsome addition to wildflower gardens. Atamasco lily is found in low woods and wet meadows. It readily colonizes road shoulders in areas of appropriate habitat, apparently benefiting from the extra light and decreased competition in this nonnatural setting. In Virginia it flowers in April or May and fruits mature by May or June. The bulbs are frostsensitive, so cultivation is feasible only in areas that experience minimal amounts of freezing in winter. Atamasco lilies spontaneously reproduce by offset bulbs. A few bulbs planted in rich soil and full sun or light shade will result in a vigorous colony. Garden propagation may be accomplished by division in early summer when bulbs are actively growing or by seed sown in April in soil amended with abundant leafmold. Atamasco lily is found from southern Virginia south to northern Florida and west to Mississippi, mostly in the coastal plain and somewhat less frequent in the piedmont region of these states. In Virginia, it is most common in counties of the southeastern coastal plain; it is rare in Virginia’s southern piedmont. The main threat to this relatively common species is habitat destruction. Gardeners should not collect atamasco lily in the wild and should be certain that all native plants purchased for home gardens are nurserypropagated, not wild-collected. For a list of retail sources of nursery-propagated plants and responsibly collected seeds, see elsewhere on this website. 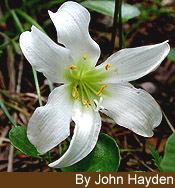 Text from 2007 Wildflower of the Year brochure written by W. John Hayden and adapted by him for the web, December 29 2006.